After the starter engine of my Triumph Legend signed off the contract last week, I’ve been stranded without a working motorcycle. As most of the days it has been snowing heavily, this hasn’t been much of a problem. However, I thought it would be time to do something. As the bike dealership didn’t seem much concerned about the problem, I came up with another idea. 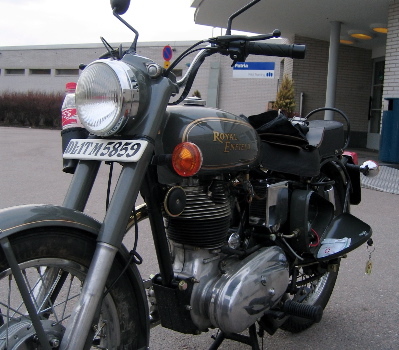 My friend Jose bought a nice fifties-style Royal Enfield motorcycle from his Indian adventure last spring, but unfortunately broke his leg shortly afterwards and so the bike was built into running state but never registered. Yesterday afternoon I then went to Rambo’s garage, and started the engine without any problems. The Engine ran fine while I rode it to an inspection station near to the Helsinki-Malmi airport, and yet again fine when riding to another inspection station after a flying lesson. However, the inspectors had very little sympathy for the machine. 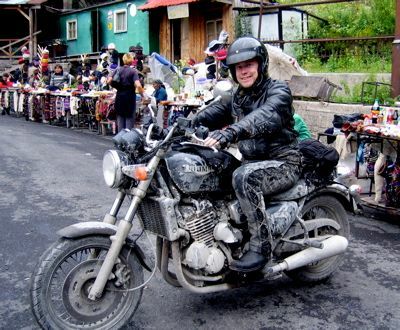 They said it wouldn’t pass into Finnish registry because its chassis lacked some EU stamps, even though similar bikes are being sold constantly by the Enfield Finnish importer. 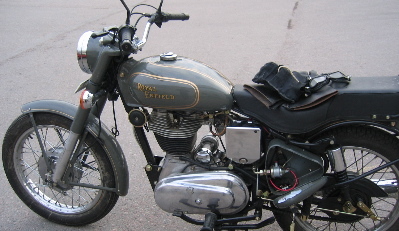 No final conclusions were reached, though, as some members of Bullets MCC, the Finnish Royal Enfield Club claimed to have the required certificates acquired from the Indian factory. A bit taken back but not yet accepting defeat, I started the bike at the station. It started on the first kick, but when I took it off the centre stand, it stopped. The fifties look of the bike quickly gathered several helpers, but the bike refused to start in the half hour we spent playing with it. After a while we figure out that the batter was empty, and that in turn had fouled the spark plug. Changing the plug we were able to get the bike running in a way, and return to the airport. 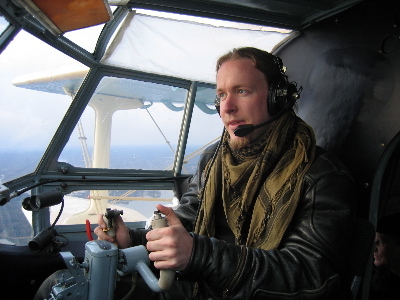 At the airport cafeteria we sat down with Erkki, the pilot of the huge Soviet forties An-2 biplane freighter owner by the Lennuklubi. He had helped me back at the inspection station together with Matti from HHRA, and as my second flying lesson of the day got cancelled because of hail, we took a look at the Antonov. A fire extinguisher pipe in the plane had to be replaced, and after that and the other startup rituals, we went for a short spin together with two Russian mechanics. As the Antonov is very expensive to operate, we only flew a very short route, but even with that I was amazed at the stability of the big plane, and even got to take a short turn at the controls. After the flight we cleaned up the plane from the liters of oil that the engine had spewed out, and I returned to try again starting the Enfield. Unfortunately it again had issues with getting the ammeter to the positive side, and when it finally started, it happened with a loud bang that shot the airbox cover open and the headlight off. With this setup I limped the bike to the nearest gas station, drained the gas tank and cleaned the carburetor. With new gas in tank the bike finally ran acceptably, as long as I kept the electricity usage as down as possible. For example, if I wanted to use both braking light and turn indicators at the same time, I had to rev up the engine or it would die. But even then, I got the bike home without incident. Now the battery is charging, and I hope that this will cure the ignition problems. 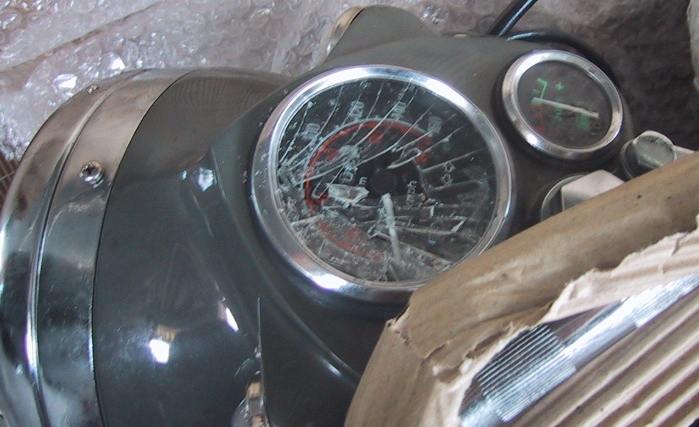 Once they’re fixed it is time to change the speedo broken by the shipping company, and then return to the inspection station with loads of more papers. 05 April 2007. 1 minute read. 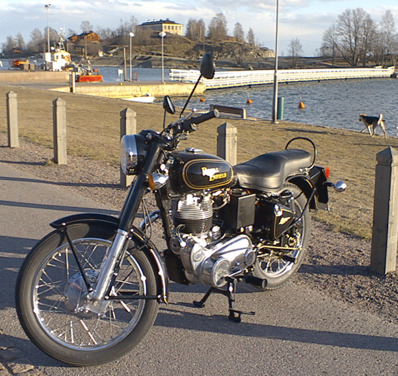 My Triumph Legend TT, which has been a trusty companion on various adventures, had an engine failure last summer. As a result, I’ve been without a working motorcycle for almost a year. 28 August 2006. 1 minute read. While I was riding with the Monkeys, my Triumph Legend TT left a friend on the road with a broken engine. As the number of motorcycles in Finland has grown drastically in last few years, but the number of repair shops hasn’t, the bike has since been waiting for diagnosis.